As young athletes progress through the youth and scholastic ranks, they expect to improve. Whether they want to perfect their jump shot, increase their bat speed, or lift more weights, kids believe that their work in practice and during the offseason will result in tangible skill development. However, young athletes don’t merely expect their own performance to improve as they get older; they anticipate that there will be better coaching and officiating and, perhaps most importantly, they expect to be outfitted in snazzier and snazzier gear as they move through the ranks. This last expectation—improved team gear—can be a source of consternation for many coaches, athletic directors, and equipment managers. After all, uniforms and other team gear can be expensive, and many young athletes don’t understand the importance of staying under budget and being fiscally responsible. Team gear customization is central to this problem. 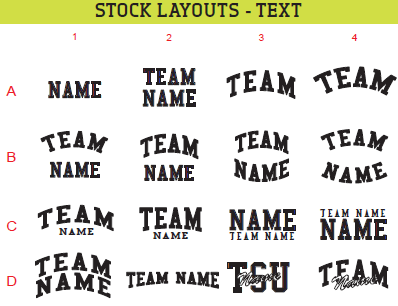 Teams want their apparel to be as personalized as possible. Today, a bland team name spilled across the front of a t-shirt won’t be well-received in most locker rooms. Yet, customization is arguably the most costly part of purchasing uniforms and team apparel, and most people charged with figuring out their team's gear are not familiar enough with customization to find the best bang for their buck. Here is a guide to team gear customization that can help. 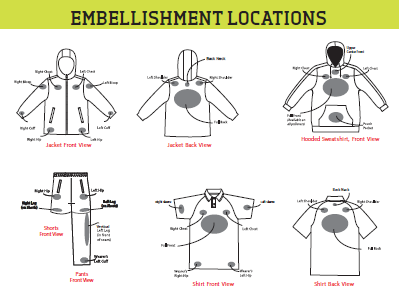 Unless you have a large budget for team apparel and can afford a fully sublimated jersey (a type of uniform that is most amenable to customization because every inch of the fabric can be dyed and designed) your customization demands will be limited by which fabric you’re using. Certain fabrics can only be customized in a specific way. For example, performance fabrics (moisture-wicking jerseys and shorts) and cotton are the most common fabrics and are often customized using heat applied graphics. Embroidery is also an option. In either case, there are certain areas on the fabric—across a seam or zipper, for instance—that can’t be customized. The sleeves, back, neck, and right chest are the most popular areas for customization. If your team wants a truly unique uniform design, you’re going to have to get creative. There are NFHS and NCAA requirements for high schools and colleges, respectively, regarding where names and numbers are placed on uniforms, as well as their size. Teams that have their hearts set on unique uniforms should look into printing their ideas on sweatshirts and travel jackets instead, which aren’t regulated and therefor can be customized however you please. Still, you should be aware that it is extremely difficult to embroider or even print a logo with super fine details. Embroidery text must be at least 1/4” tall, and print text should always be reviewed during the proofing process. A detailed logo might sound appealing in theory, but in practice it will look like an amorphous blob if you’re not mindful of these customization realities. Team dealers can outfit your youth and school teams in top-notch gear with high-quality customization as long as you’re honest with them. You should make your budgetary constraints known from the beginning; one-color customization is a great option, and team dealers can work with you to create a design that you’re proud of even without the benefit of multiple colors. Team dealers can also bring a sample embroidered logo to you in person so that you can approve it. This risk-free customization process will take the pressure off of you and allow your team to make the final call.